For almost 40 years, I have been on my hands and knees, digging through trash. It is to the point where more people know me by my “a.k.a.” name—The Downeast Digger—than by my actual name. It started innocently enough, as my older brother towed my sister and me out in the trailer of our old farm tractor one day, deep into the woods behind our childhood home to a sloping patch of brambles and briars, littered with old pieces of farm equipment and scattered buckets. It was my first bottle dump, which is essentially a 100-year-old trash dump where any organic, wood or paper trash has long since rotted away and most of what remains were glass bottles still hiding beneath the soil and leaves. I dug this pincushion doll from a Victorian-era trash site. It always amazes me that these things can survive, often with the original enameling nearly intact. I sometimes like to consider myself an archeologist or a historian or something with a more-impressive sounding title. And while I could spin it that way to some extent, the truth is that I am compulsively drawn to the hunt of other peoples trash, which has sat peacefully under the ground for at least a century, finding things that once had no value at all and bringing it out into the sunlight where it may have great value today. The value may be true monetary worth to bottle and glass collectors or the value may be just in my own fascination and interest in what I’ve uncovered. This is what a perfect and complete pincushion doll looks like. By the time I would find one in a bottle dump. The clothes would have long since deteriorated away. But occasionally, if I’m lucky, I can dig something that has a special sentimental value. Those are the best of all. 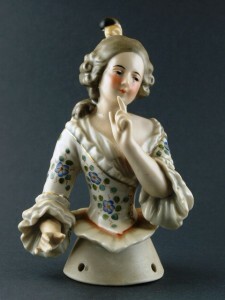 One such “home run” artifact was a small porcelain doll—or half a doll really—that I dug many years ago. I didn’t know at the time that what I had dug was a pin cushion doll. It was only the top half of a fancy Victorian-dressed woman, and around her corseted waist were three holes where she would be sewn on to a large pincushion to be set on a sewing table or dresser. 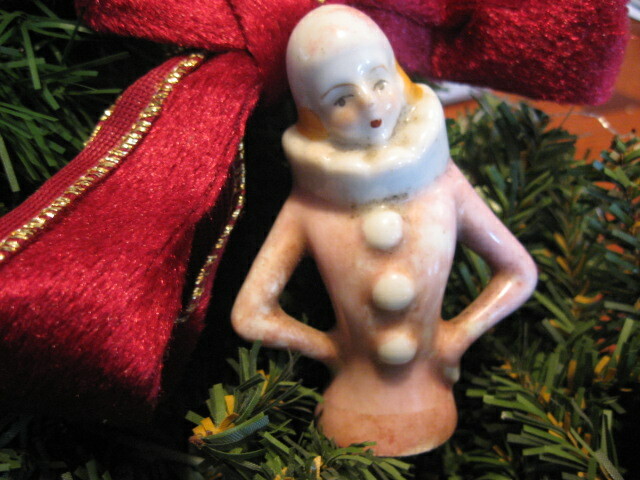 When I dug it, I remembered that my Aunt Dorothy had a row of similar dolls on a small shelf in her living room. So I washed the doll up and decided to give it to her for Christmas. Now, Aunt Dorothy and I loved each other and got along fine, but we didn’t normally exchange gifts. And I always had the nagging feeling that she still remembered the time then I, as a 9-year-old boy, nearly set her daughter Heidi on fire after the grown-ups had gone inside after a summer BBQ and I decided that the hot coals needed a little more lighter fluid. So, two decades later, after a big Christmas hug and kiss, I handed her a little box and she couldn’t imagine what it was. She opened it up and I’ll never forget the look on her face, she was speechless! Evidently, the pin cushion doll that I had dug was especially rare and valuable, because the woman’s arm was extended out and not attached to her body, hands-on-her-hips style. Aunt Dot said that usually the hand or arm would have broken off, because they are so delicate. When I told her I dug it while bottle digging in Maine, she simply could not believe it! 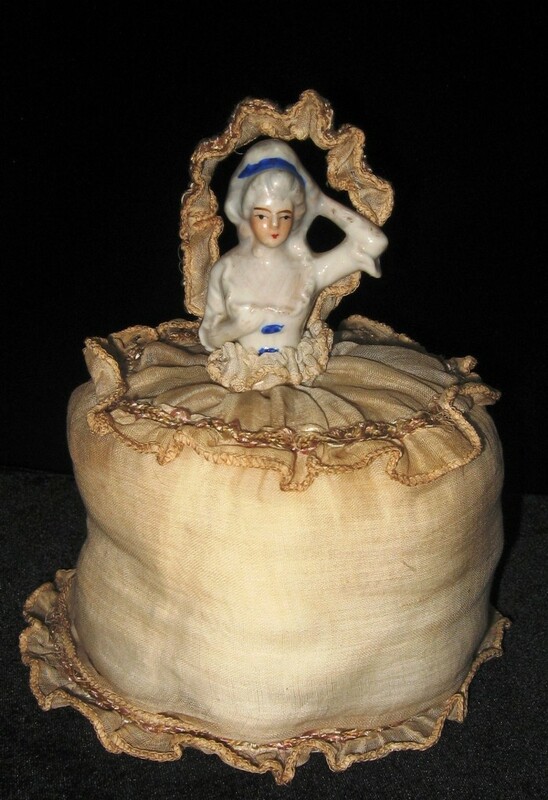 Most Victorian pin cushion dolls were produced in Western Europe, particularly Germany, along with all other types of bisque dolls being made at that time. The prices for them today range, generally, from $50 to $500 and beyond. One like this would sell to collectors for $300 if original and in excellent condition. 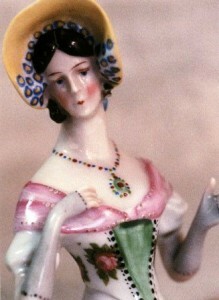 This is a beautiful example of an “arm-extended” pin cushion doll top. You can see how an undamaged example would be hard to find, because if the doll were to just tip over on the table, the arm could easily break off. 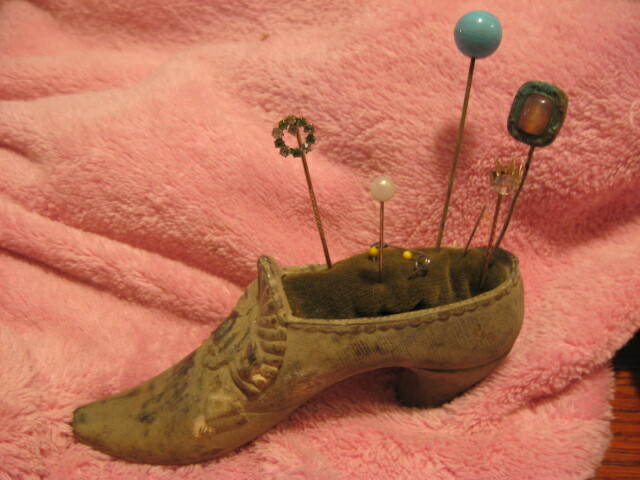 This is a bronze “pin cushion shoe” that I also dug from a Victorian-era trash site. I added the cloth center and pins myself later. Bram Hepburn collects 19th-century New England bottles and glass, having spent the last 30-plus years digging and diving for bottles in New England and upstate New York. He lives in Eliot, Maine.